Daily Headache: What Causes Daily Headache? First: A NEW ONSET OF A DAILY HEADACHE COULD BE A MEDICAL EMERGENCY AND SHOULD NOT BE IGNORED. CALL YOUR DOCTOR IF YOU HAVE NEVER HAD THIS BEFORE. Ok..done shouting now. I just wanted to get that point across and if you are curious please read more about types of emergency headaches. What many people do not realize about this problem is that they didn't start out that way! This problem develops over time and is usually multi-factorial. In fact, chronic headaches are now considered a form of invisible chronic illness. There are actually several ways that a person can move into this syndrome. One is called transformational migraine. This is when migraines are in the process from transforming from episodic (one a month or so) to several times a month and increasing severity. The natural reaction to transforming migraines is to take more medication! Then what happens? Well, the headaches become more frequent so you take the medication more frequently and...you can see where this is leading, right? 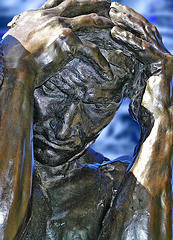 Transforming migraines eventually become all run together, and are now a chronic daily headache. Another way people develop chronic daily headaches is from mistreatment or lack of treatment after head injuries. NOTE: I said head injuries as in multiple insults to the brain. A single blow to the head rarely results in chronic headaches unless the blow was severe enough to cause a bleed or some other sort of damage. Many times I will evaluate someone for post-traumatic concussions after a mild head injury. Family, friends and co-workers find it hard to believe the person now has severe refractory headaches. or over the counter meds and products containing pseudofed. As a result you may have analgesic rebound headache. Analgesic rebound headaches occur when you are using anti-inflammatories to treat your headaches more than three times per week. such as anemia (low blood count), hypothyroidism (low thyroid), chronic hypoglycemia (low blood sugar), Vitamin deficiencies (kind of rare), hypertension (high blood pressure), and last but not least, sleep apnea! Well, alot of medications!! Way to many to list here, but the clue is if you just started a new medication and within a day or two you start having headaches that might be the cause. Also, if you currently have headaches and the medication makes them worse within a day or two, again this too is a cause. Post traumatic headache is a syndrome that occurs after a head injury that is severe, or after a series of head injuries. It is characterized by moderate to severe daily headaches with breakthrough migraines. Although rarely discussed in the context of headaches,if the history shows exposure to items causing headaches, we test and then eliminate. What items? Lead, carbon monoxide (oh that old furnace! ), exposure to paint fumes (professional painters have this problem)and others who work around chemical fumes without protection. I have had one or two documented cases of patients moving into an old musty house and developing migraines. With further inspection, the walls contained mold, which was causing the headaches. Regardless of cause, daily headaches are a serious condition deserving of appropriate treatment. While many people continue to search for the best headache medication what they fail to realize is that lifestyle changes play a very important role. Return from Daily Headache to Home Page.